If you need a comprehensive California life insurance policy, Strong Tie Insurance is your solution. Planning for the future can be difficult. You should be able to spend more time enjoying life, not stressing over life insurance. 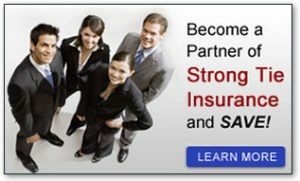 For those of you on the hunt for a life insurance company, you’ve come to the right place! Strong Tie Insurance has seven locations in CA, allowing our agents to easily write throughout the entire state. Our agents are experts on California life insurance and can help you streamline the process of selecting a customized life insurance policy. Our dedicated team of life insurance professionals understand the California market and regulations and can find the right plan – or mixture of plans – for your specific needs. Determining the appropriate type of life insurance can become a difficult and daunting task. Yet the peace of mind you will feel knowing that your beneficiaries are protected if something happens to you is incomparable when you have California life insurance. Don’t waste your time with another California life insurance company, call Strong Tie Insurance today for more information about California life insurance.